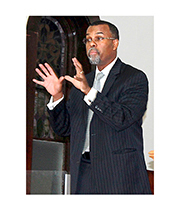 Eddie S. Glaude Jr. is a scholar who speaks to the black and blue in America. His most well-known books, Democracy in Black: How Race Still Enslaves the American Soul, and In a Shade of Blue: Pragmatism and the Politics of Black America, take a wide look at black communities and reveal complexities, vulnerabilities, and opportunities for hope. Hope that is, in one of his favorite quotes from W.E.B Du Bois, “not hopeless, but a bit unhopeful.” Other muses include James Baldwin, Malcolm X, and Bobby “Blue” Bland. In addition to his readings of early American philosophers and contemporary political scientists, Glaude turns to African American literature in his writing and teaching for insight into African American political life, religious thought, gender and class. 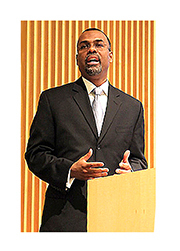 Glaude is the William S. Tod Professor of Religion and African American Studies at Princeton University. He is chair of the Department of African American Studies, a program he first became involved with shaping as a doctoral candidate in Religion at Princeton. He is the current president of the American Academy of Religion. His books on religion and philosophy include African American Religion: A Very Short Introduction and Exodus! Religion, Race and Nation in Early 19th Century Black America, which was awarded the Modern Language Association’s William Sanders Scarborough Book Prize. Glaude is also the author of two edited volumes, and many influential articles about religion for academic journals. He has also written for the likes of The New York Times and The Huffington Post. Known to be a convener of conversations and debates, Glaude takes care to engage fellow citizens of all ages and backgrounds – from young activists, to fellow academics, journalists and commentators, and followers on Twitter in dialogue about the course of the nation. His scholarship and his sense of himself as a public intellectual are driven by a commitment to think carefully with others in public. Accordingly, his writing and ideas are cited and shared widely. Some like to describe Glaude as the quintessential Morehouse man, having left his home in Moss Point, Mississippi at age 16 to begin studies at the HBCU. He holds a master’s degree in African American Studies from Temple University, and a Ph.D in Religion from Princeton University. He began his teaching career at Bowdoin College. He has been a visiting scholar at Amherst College and Harvard. In 2011 he delivered Harvard’s Du Bois lectures. In 2015 he was awarded an honorary doctorate from Colgate University, delivering commencement remarks titled, “Turning Our Backs.” He is a columnist for Time Magazine and regularly provides commentary on radio and television news programs like Democracy Now!, Morning Joe, and the 11th Hour. He hosts the podcast AAS 21, recorded at Princeton University in Stanhope Hall, the African American Studies department’s home. Dr. Glaude is a regular guest on national TV news programs, including Morning Joe on MSNBC. He was recently parodied on a Saturday Night Live sketch featuring Bill Murray as Steve Bannon. Glaude is currently working on a book about the great 20th century novelist and social critic, James Baldwin. 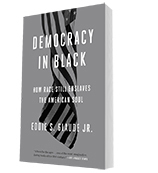 “Eddie Glaude speaks some hard truths in this important new book. Glaude is the fiercest of thinkers, and this book is a brilliant and crucial prescription for necessary change.” — Henry Louis Gates Jr.